Here is a first-hand account of the Indy stage collapse that is well worth reading, especially on aspects of social media in covering the disaster. The 10 Dumbest Restaurant Laws. None are in Kansas. Speaking of Kansas, got to walk through the almost finished Drury Broadview Hotel in downtown Wichita. They have done a wonderful job with the restoration. If you like a historic hotel, please consider it the next time you are in town. 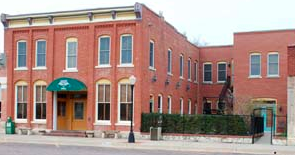 Is there a better restaurant value anywhere in the U.S. than then Grand Central Hotel and Cafe in Cottonwood Falls, Kansas? For lunch yesterday, I had a bowl of their wonderful beans and rice soup along with a cobb salad with huge chucks of tasty real steak. Total tab before tip? $8.12. The Grand Central has a Four Diamond rating and if you are anywhere in the region, well worth a visit. Finally, the first-ever "non-human" disc jockey makes "her" debut in San Antonio tomorrow.